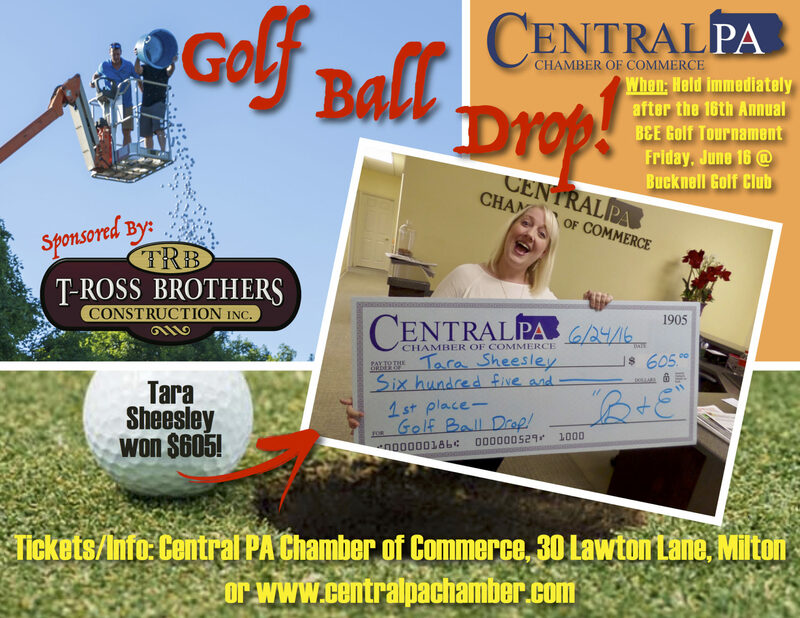 2nd Annual Golf Ball Drop! The 2nd Annual Golf Ball Drop! will be held following the 16th Annual B&E Golf Tournament on Friday, June 16 at Bucknell Golf Club, Lewisburg. As many as 1,000 specially numbered golf balls will be dropped onto the practice green near the clubhouse. The first three golf balls (in order) to hole out – or be the closest – to the designated hole are the winners! First place receives 25% of the pot/2nd place – 10%/3rd place – 5%. The cost to take part in the Golf Ball Drop! is $10 per golf ball, which are specially numbered for the event. You may register here, or see a Central PA Chamber staff member or designated volunteer for tickets. You do not need to play in the golf tournament or be present to win. Winners will be notified after the contest, and arrangements will be made for check presentations. The chances of winning depends on the number of entries (up to 1,000). If sales are maxed out, the winner would receive $2,500; second receives $1,000 and third receives $500. The Golf Ball Drop! officials will determine which golf balls fell or rolled into the hole first, second and third; or take measurements of the closest, if not holed out. In the event of inclement weather, an alternative method will determine a winner. The phone numbers and e-mails collected during registration will only be used to notify winners and share information related to this event.